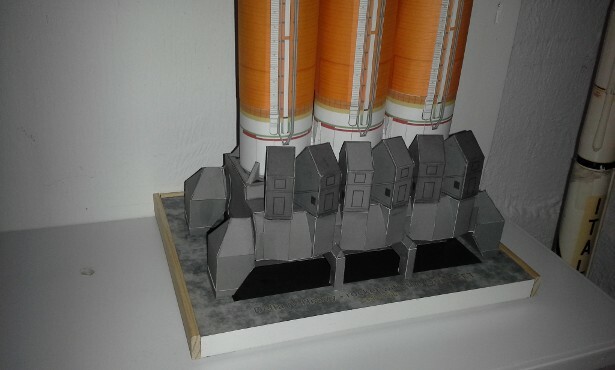 A few weeks ago, I began to look more seriously into the paper scale space models made available by Mr. Alphonso Morero on his website - AXM Paper Scale Space Models. 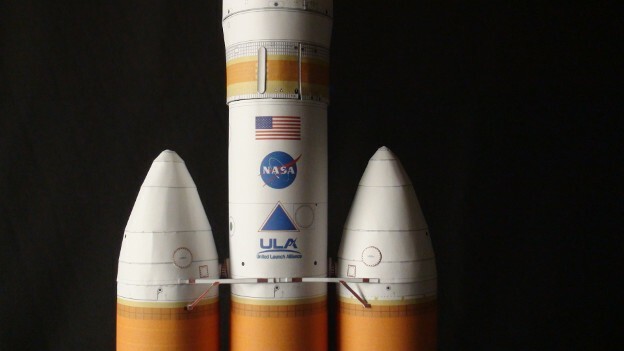 Not only were there a very large number of Space Shuttle related products, including "mission specific" payloads for each important Shuttle mission, but there are also models of other space vehicles available for down load and construction. The first AXM models I worked on were models of some of the Commercial Cargo Transportation vehicles which deliver consumables and science experiment equipment to and from the ISS, specifically the Orbital/ATK "enhanced" Cygnus Spacecraft and the SpaceX Dragon Spacecraft. These were built to show these vehicles next to our Revell ISS Model. Recently, I decided that I wanted to build a model of the Orion Spacecraft and I remembered that AXM offered one in the EFT-1 configuration. Exploration Flight Test 1 was the first unmanned test flight for the new Orion Multi-Purpose Crew Module, launched aboard the ULA Delta IV Heavy launch vehicle in December 5th, 2014. 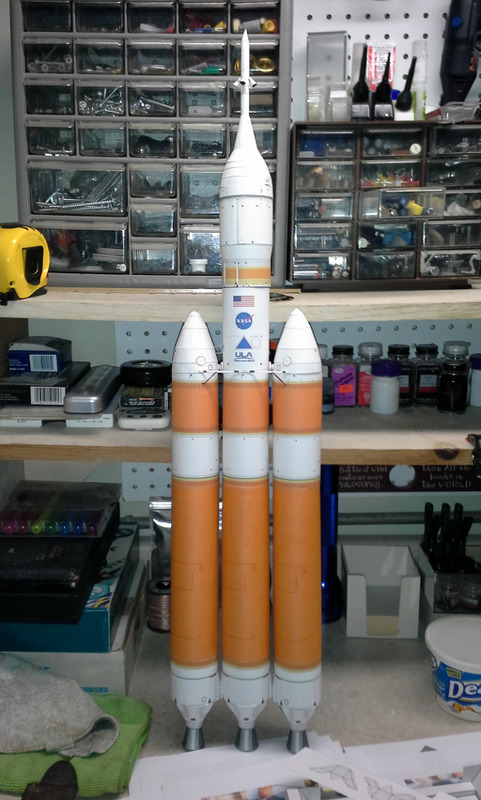 This is the Delta IV on the SpacePort Workbench just nearing completion of the booster. 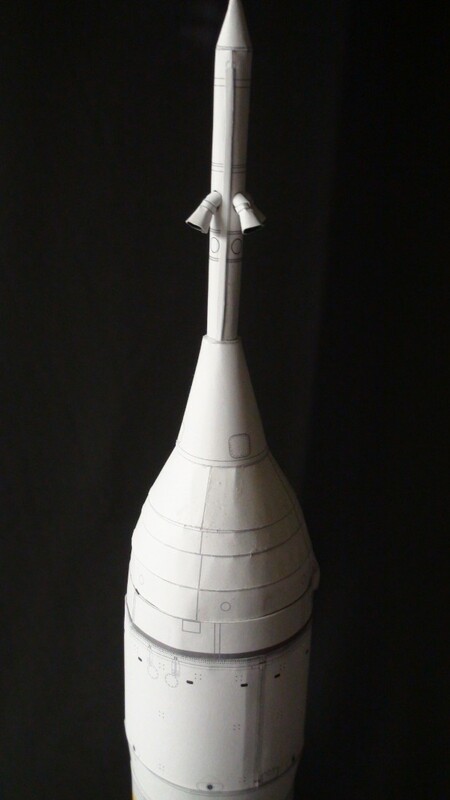 There are three Common Booster Core sections, but each one becomes specialized as Left, Right and Center, with the Center section carrying the Upper stage and Payload. The Orion Spacecraft and its Launch Abort System, Service Module Cover panels and the Delta IV Upper Stage is seen off to the right. 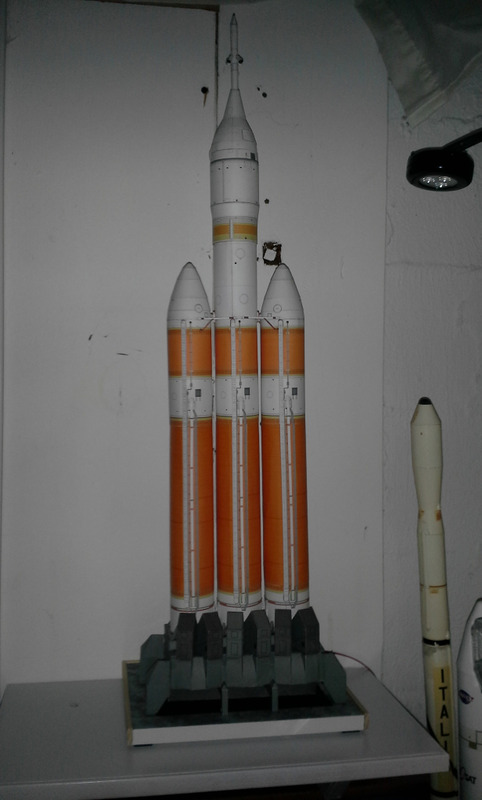 This was built to go specifically onto the Delta IV as a permanently-attached part of the model. 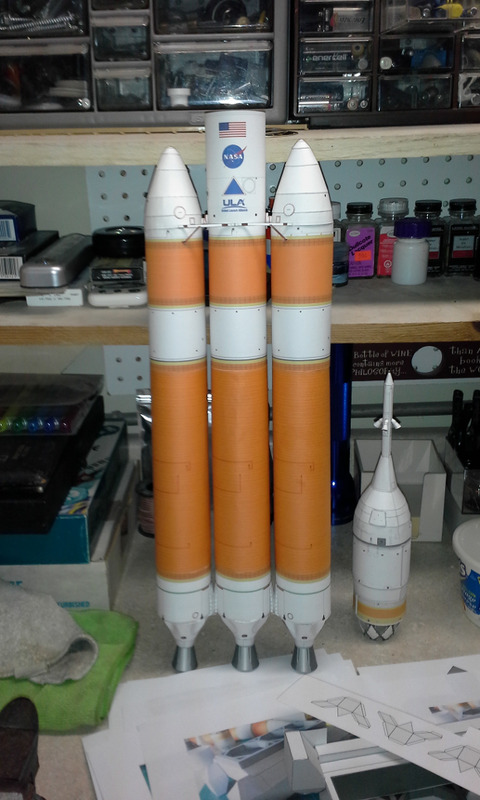 I built a separate Orion Spacecraft and Delta Upper Stage model to be displayed separately. More on this on a separate page. Here, the Orion/LAS/Upper Stage unit has neen integrated onto the Central CBC. 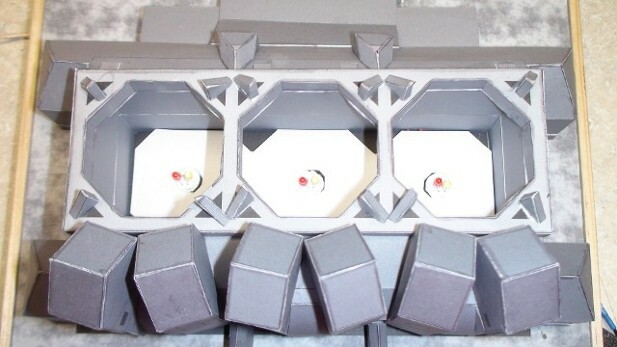 A close-up of the CBC interfaces, including the attachment trusses for the Delta IV booster. The detail that AXM puts into these is very impressive, but they are designed to allow any competent modeler to build them. The printed detail includes the "livery markings" placed on the Center CBC. 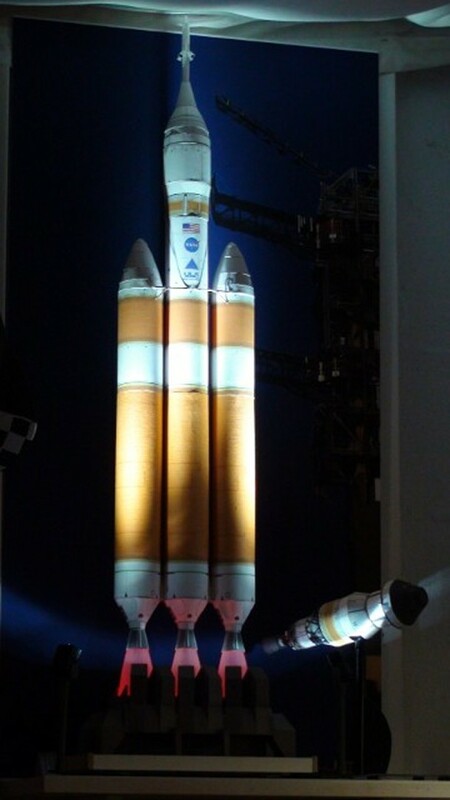 These markings are common to all NASA Delta IV boosters. The U.S. Air Force or National Reconnaissance Office emblem would replace the NASA "meatball" for boosters used for those agencies. A close-up of the Orion LAS Cover and Abort Motor. The completed vehicle needed a support mechanism for display. 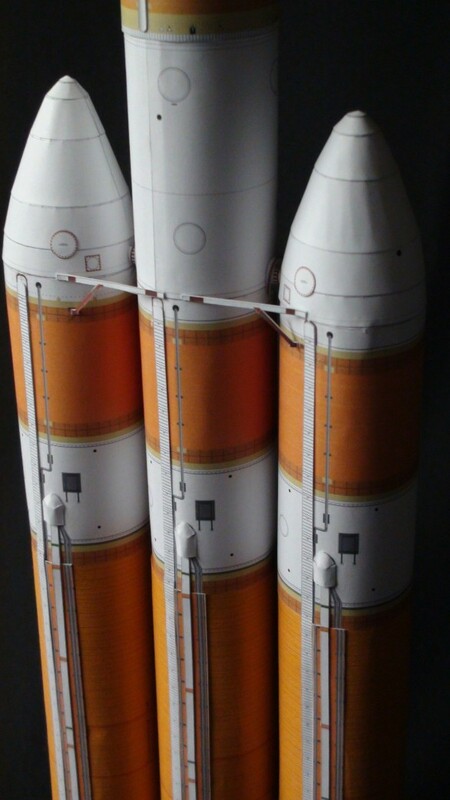 Luckilly, AXM offers a 1/96 scale Launch Table for the Delta IV Heavy, created by German modeler. Michael Knoblach. 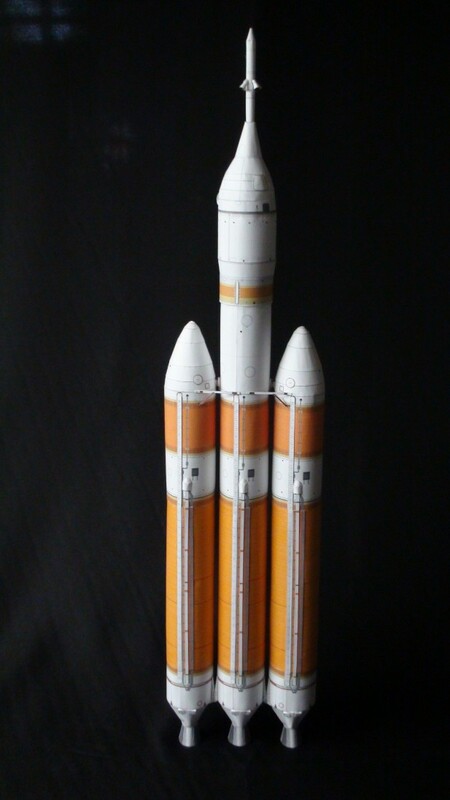 Care must be taken to print out the Delta IV Launch Table model's plates on the correct "A4" paper size. or you will need to manuver the PDF pages around to get all necessary parts printed onto U.S. 8-1/2 by 11" sheets. The original size of the parts must be maintained, or the booster will not fit the Cradle. 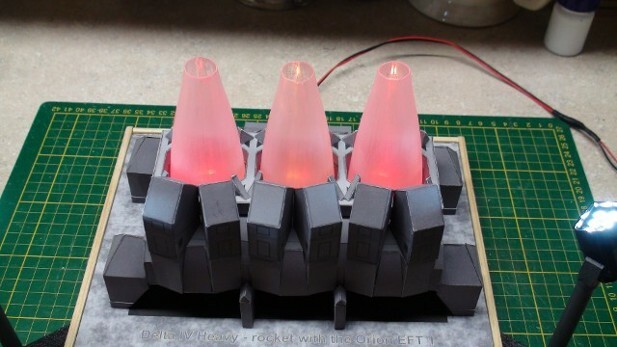 We added Red & Yellow 5 mm LEDs inside the table, to indicate "ignition" of the three RS-68 engines. We used suitable clear plastic "Champagne Flutes," cut down to correct legth and used them as "exhaust plumes." 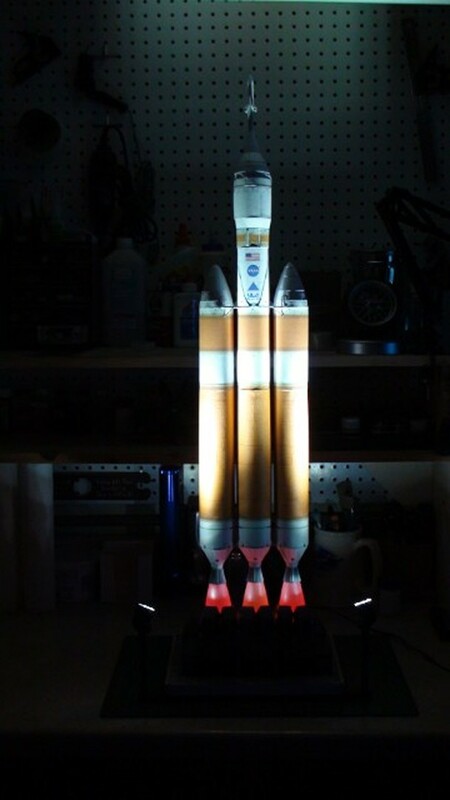 The sections were placed over the LEDs, after sanding to dull the surface and help dispurse the LED light and and support the Delta IV Heavy just off of the pad. 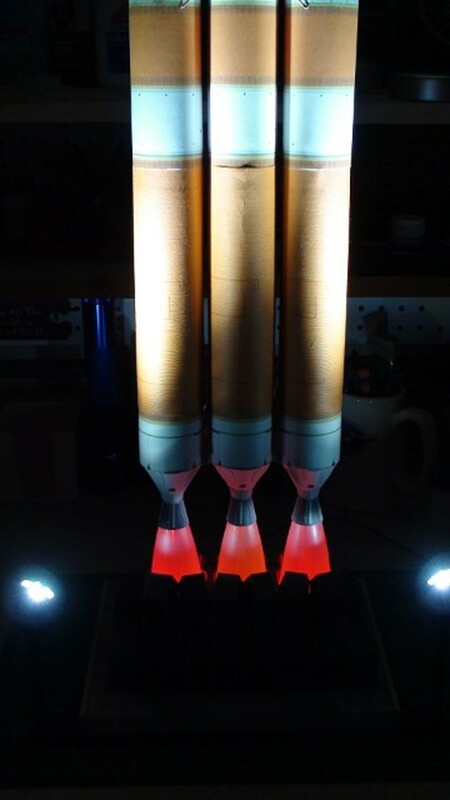 In order to get the rest of the rocket illuminated, we decided to use "Blocklight" 9-Volt flashlight units, purchased through A,azon, just like we used on the Apollo Saturn V display, as floodlights. 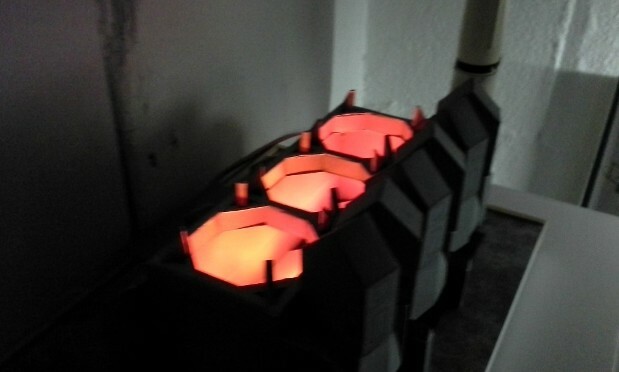 The light modules were mounted onto 3/8" plastic tubes, used as poles, with heat-bent yokes made from 1/8" thick ABS plastic. 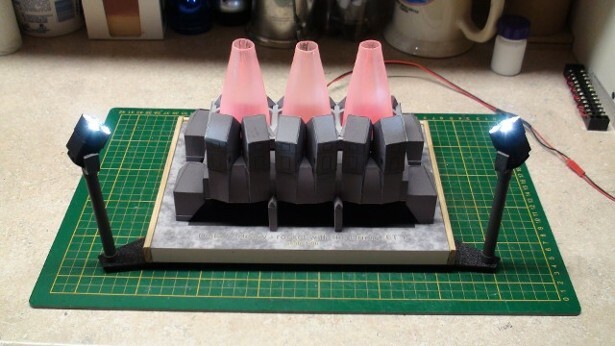 Thank You to Alphonso Morero and AXM Paper Scale Space Models for providing such wonderful printable model kits. You can find the link to the AXM Space Models website on our "Links" Page.